DETROIT – Armando Galarraga of the Detroit Tigers lost his bid for a perfect game Wednesday night with two outs in the ninth inning on a call that first base umpire Jim Joyce later admitted he blew. 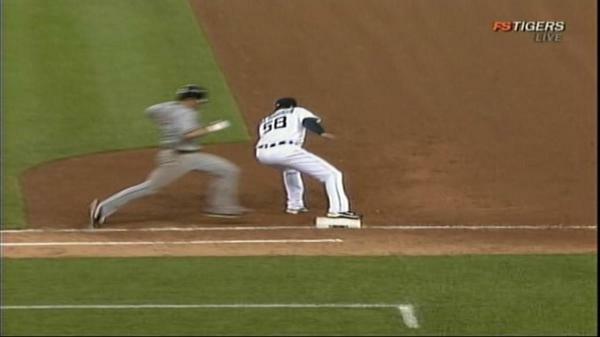 First baseman Miguel Cabrera cleanly fielded Jason Donaldâ€™s grounder to his right and made an accurate throw to Galarraga covering the bag. The ball was there in time, and all of Comerica Park was ready to celebrate the 3-0 win over Cleveland, until Joyce emphatically signaled safe. â€œIt was the biggest call of my career,â€ said Joyce, who became a full-time major league umpire in 1989. Tigers manager Jim Leyland immediately argued the call and was joined by several of his players after the final out. Galarraga was trying to pitch the third perfect game in the majors this season. Something that professional baseball had never seen before. Instead, we’re left with a controversy that is likely to increase pressure for expansion of instant reply in Major League Baseball. Unfortunately, the rules of Major League Baseball do not seem to provide an opportunity for the call at First Base to be reversed.